Amazing wipes! The fabric is so soft and thick and they are always super wet, not dry like the others. I love that they donâ€™t have chemicals and they are great quality! The only wipes I was willing to use on our newborn. No harsh ingredients or even natural ingredients that may irritate such sensitive skin. I love water wipes. They are so natural that I can use them on my daughter's face and hands, on myself, etc. We take them everywhere! These were the only wipes we could find that didn't have extra ingredients including essential oils. Humans genital area is self-cleaning and water is the best thing to use. We also like that they come in a bulk size. Wipes create garbage and it would be great if these were biodegradable. We use them for eldercare and because of not having a bunch of ingredients they have been excellent on sensitive skin. I agree with the other comments about them sticking together and the sheets are on the small side. Thanks for the tip about the wipes dispenser. Very glad to find these and recommend them. I feel comfortable using these knowing there is nothing really in these wipes except water and a little extract. Many wipes are labeled as natural but contain soooo many additives. All we used in the hospital were cloths dipped in water and it's really all we feel we need. There's nothing else like this on the market. However, the sheets stick together, it's hard to get just one to come out of the pack at a time. We have been using these for 17 months with our daughter and the only time she has had a bad diaper rash was when we ran out and tried another brand. The only complaint is that they stick together. Love these wipes! I wanted to start using a product with the lowest possible ingredients for my newborn and Iâ€™m glad I did as she has had no irritation with these wipes. My only issue is that most times I try to pull one wipe out, 2-3 come with it. Luckily they stay quite wet even when sitting out, so if I leave an extra on the changing table I can use it 2 hours later. These are the best wipes Iâ€™ve used. My baby is 5 months old now and Iâ€™ve tried a couple other brands, but would use a few wipes then toss them and go back to using these water wipes. I like that they have no scent. It is difficult to get them out of the pack sometimes, I may get a wipe dispenser eventually. But overall these are great and itâ€™s the only wipes I will use from now on. I recommend buying them. These wipes have been great for my little guyâ€™s sensitive skin. No scent and super gentle. My only complaint would be the difficulty getting them out of the pack one-handed. This was easily remedied with an Oxotot wipes dispenser. Would highly recommend these! Nice product. Excellent and professional customer service. I had issue with my order they answered me right away and shipped out the new order. Well.ca would be my first place to go to buy anything as of now. These are amazing for our LO. They've been highly recommended by a friend who's used them for her 2yo, and will co tinue to use for her new LO. We love these wipes! We prefer them over Honest and 8th generation and they're a great price to boot! Perfect amount of wetness for clean up and so gentle on baby's bottom. Great wipes. After battling diaper rash for 3 weeks, switching to these was the best decision. They donâ€™t irritate skin. No chemicals to worry about. I love these. They are the most gentle wipes and helped reduce my sons diaper rash (even though we were already using sensitive skin wipes). Will purchase again. These are the best wipes ever!!! I love them and happy they exist. I use these as personal wipes for myself. They are really moist and work wonderfully well. I like the fact that they are mostly water with no added perfumes or chemicals. The price is also very good. I love these wipes-- I use them with both the Naty diapers and the Honest diapers and have not had any diaper rash so far. Nice and gentle and clean really well. We really liked these wipes, but they pull out one by one so we canâ€™t use them in the wipes warmer. Itâ€™s actually quite annoying. The wipes are fresh and have little scent, but I wish they would pull out in a chain. The most gentle wipe for my baby. No additives = no reaction. Worth the price. So glad Well is carrying these now. We used cloth wipes to start (And still do for a lot of things) and so were looking for a disposable wipe with just water. We've been happy enough with these. I am so happy that Well.ca carries these wipes! 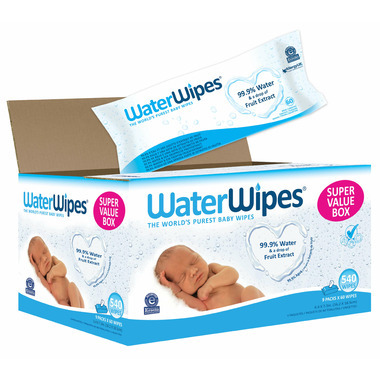 There is a lot of hype about water wipes and rightly so! I feel comfortable using them as the "everything" wipe.. diaper changes as well as wiping my baby's hands and face. I am comforted by how "natural" they are and will definitely continue to order. 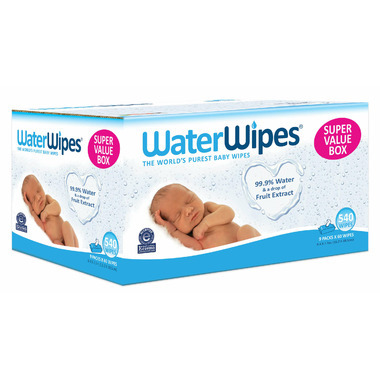 We used Waterwipes for my daughter, birth onward, they are truly great wipes. They hold together and never tear or crumble apart. No scent, no chemicals, can feel good about using them on bottoms, hands/face. Never a bad reaction. These have been difficult to find, sometimes available on Amazon. Am pleased that We'll.ca now carries them. These are worth their price. I love these wipes for my daughter. They are incredibly gently on her skin and they arenâ€™t flimsy like some other wipes out there. Since they are 99% water I use them to wipe her face as well to feel refreshed. I highly recommend these. The best wipes on the market! Nothing extra. Help prevent irritating the skin. Very moist. I would recommend a wipe warmer as they are cold! I love this product. I am so happy that Well.ca is selling this product. I have looked every were for this product, my friend told me to go and look on Well.ca and I did. Thank you so much Well.ca for carrying this great product and at a reasonable price too. Great product. Use these more than any other wipe. Absolutely thrilled to see well carry WaterWipes! These are by far the best wipes out there! We had difficulty finding them in Canada once Amazon.ca stopped selling them at a reasonable price. So....thank you well.ca!